Dimensions: 5.5"x 3.5" (0.23" thick) Due to the nature of the material, the card is a little bit smaller than the regular-sized card. 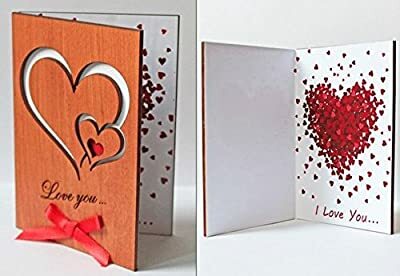 Quantity: 1 Greeting Card with matching envelope. Inside: Big Heart and "I Love You" inscription. Can be given to anyone - man or woman. Proudly MADE in the USA. Please do not support dishonest sellers who sell chinese knockoffs. NOTE: This is a real wood card. Therefore, the wood grains can vary slightly, making each card unique. It will make the best unexpected gift for that person who already has everything! Great for any occasion: Father's Day, Wedding / Dating Anniversary (especially for Fifth - Wooden), Valentine's Day, Your Loved One's Birthday Celebration; as Miss You / Thinking of You Card. NO-RISK PURCHASE! If you're not happy, we're not happy. That's where our "Love It or Send It Back" policy comes in.